I love Pokemon Shuffle's gameplay mechanics. I like how this one is more focused on being strategic rather than fast-paced. I enjoy collecting Pokemon to exploit weaknesses of ones I haven't caught yet. I enjoy the Mega Evolution power-ups that have screen-clearing effects. But I hate that I'm constantly behind this barrier of having to pay actual money in order to simply keep playing the game. 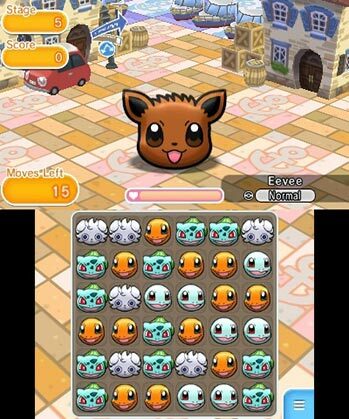 Pokémon Shuffle is a fantastic match-three puzzle game marred by an uncharacteristically sleazy suite of microtransactions, and your ability to enjoy the former will hinge directly on how well you can ignore the latter. As a game you can pick up and play for a few times each day, Shuffle is a blast - the methodical, move-based matching action, fun implementation of Pokémon powers, and appealing presentation all make for a top-notch puzzler. 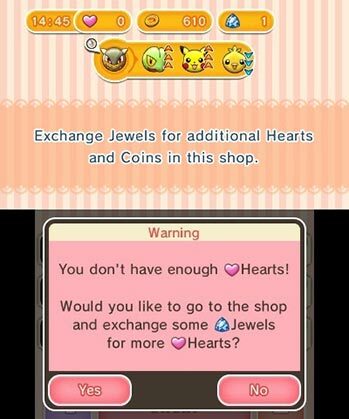 If you need something you can play for hours at a time, however, your best bet is to ignore the in-game shop altogether; take the money you'd spend on an afternoon's worth of Jewels, put it towards Pokémon Battle Trozei instead, and let the endless supply of Poké-puzzles tide you over between Shuffles. Pokémon Shuffle is cute, but don't let that fool you. If you've got a bottomless wallet full of cash to spend on the game, you'll find that the entertainment value is pretty up there. If not, you'll want to skip out on this outing for something more substantial -- like putting down the money to own one of the actual Pokémon games instead, where you'll have markedly better luck capturing one or two. Heck, you could capture them all for less money than it would take to best Pokémon Shuffle. Pokémon Shuffle is a very cute game with enjoyable music and adorable designs. Bringing Mega Evolutions to the scene as well as Type Weaknesses makes it feel more like Pokémon and less like a puzzle game. It’s a huge bummer waiting for a turn, but you can’t beat the price of free. I’ve found myself becoming more and more addicted and playing every couple of hours. It’s fun and challenging enough to keep Pokémon and puzzle fans entertained. That point aside, the music is cheery and not overwhelming, it’s cute and nicely animated, and the “recharge” time for another play session is brief enough that it’s fully playable without any financial commitment. I don’t think it’s necessarily the best of the freemium bunch, but it holds its own as a minor time-waster. This won’t satiate the hunger for the next full incarnation of the series, just provide an added distraction while watching old episodes of the animé. ...The other issue is that pretty much every power-up is oddly expensive outside of the clear-cut best value 800 Coin turn extender, which feels like a win button in some cases. 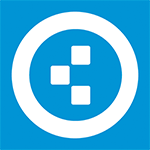 No Play Coin support is another missed opportunity. Anything truly enjoyable about the game is ruined by the microtransactions. 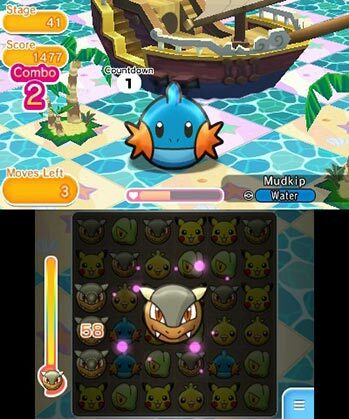 What Nintendo has done with Pokémon Shuffle is hook gamers with the free-to-play model in a far better way than it did with Steel Diver, choosing a genre that appeals to a wider audience. Correcto como puzle, sólido en sus mecánicas y llamativo, pero las microtransacciones frustran y hacen que jugar sea un verdadero incordio. La baza "Pokémon" no vale para todo. Es entretenido y adictivo. El universo Pokémon está bien implementado en evoluciones, tipos... Microtransacciones intrusivas. El porcentaje de captura es muy aleatorio. Partidas cortísimas. Pokémon Shuffle nos gusta. Es un juego que coge la esencia de Pokémon (atrapar, enfrentar y entrenar criaturas, con sus fortalezas y debilidades), la introduce en un juego de puzles temáticamente cuidado (con sus diseños, sus melodías de la saga, etcétera) y consigue divertir... hasta que se te acaban las vidas. Entendemos que es un juego gratuito y que es necesario rentabilizar la experiencia, pero creemos que hay mejores opciones que el "o pagas, o esperas, o no juegas". Os fãs deste tipo de jogo ou mesmo os fãs de Pokémons em geral não vão ficar desiludidos se o experimentarem gratuitamente, mas é impossível não ficar com a sensação que se houvesse uma opção de pagar um determinado valor e eliminar a espera de vez, em vez de comprar cristais que dão apenas umas horas de jogo, seria uma melhor opção. 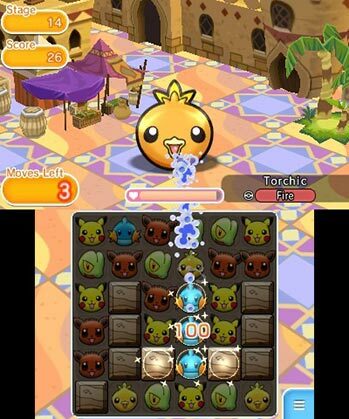 Pokémon Shuffle soffre la sfortuna di tanti freemium, e cioè un sistema di microtransazioni abbastanza subdolo che mette alla prova la pazienza del giocatore nella speranza che prima o poi cacci un po' di grana. Ed è veramente un peccato perché le meccaniche di base sono molto divertenti e la cattura dei pokémon è stata implementata a dovere, stimolando la voglia di giocare una partita dopo l'altra e di collezionarli tutti. Pokemon Shuffle пытается усидеть на двух стульях сразу. Игровой процесс стал немного глубже, но всё ещё боится оторваться от "казуальных" корней. В то же время система монетизации мешает расслабиться и куда лучше бы подошла к игре с развитыми тактической и ролевой составляющими. Хорошо, что компания Nintendo не боится экспериментировать с не самыми популярными у геймеров идеями. Но если уж начала, стоило решаться на большие шаги и перемены. Pokémon Shuffle is uiteindelijk best een leuk spel geworden en is leuk als je af en toe niks te doen hebt en even een paar minuten een game wilt spelen. Het idee achter het drie-op-een-rij principe is goed uitgewerkt en zorgt met de Pokémon-elementen voor een unieke Pokémon-sfeer. ...Geld in deze game stoppen is wel het laatste wat we verstandig achten en is beter te besteden aan een volwaardige Pokémon-game.